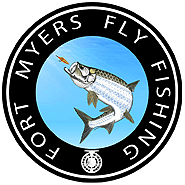 When your booking for your next Fort Myers fly fishing charter it is very important to find out what type of boat will be fishing from. The important thing to remember is that no matter how good the fishing is, if the boat you are fishing from in is not designed for fly fishing, you’re going to have a bad time. Fly fisherman must be sure to that the boat you’re guide uses does not impede your ability cast. For example a T-Top is a nightmare for fly fisherman, it is always in the way. We had our Bluewater flats boat was custom-built to our specifications to be what we consider the ultimate flats and backcountry boat. There is no other boat in its class that has a 99 inch beam or more square feet of deck space. In addition it was important to have in gunnel rod boxes. The rod boxes protect our tackle, and the tackle our clients might bring on their charter. We don’t want your buddy stepping on your beautiful fly rod, your gear will be safe and sound in the rod boxes. Our photo album isn’t working properly at the moment we will have it back working shortly.